In both cases, idibu will indicate what the problem is and how you can fix it. Please follow the instructions inside the email or error alert to post successfully next time. If you are still struggling after following said instructions or anything seems unclear, please let our support team know and we will be happy to assist you. Note: In rare cases, you might see an "Unknown error" show up in your posting feed. This means that idibu wasn't able to precisely identify the cause of the issue yet. We work on identifying all such cases, but if you do see an unknown error that we haven't got to yet, please don't hesitate to let our support team know and we will take care of it for you! Depending on the error, you may need to contact your internal idibu account administrator to resolve the issue for you. 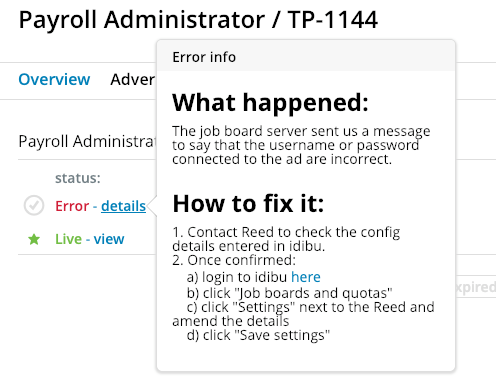 For example, if you have run out of posting credits with the board, or the board user credentials have been changed and need updating inside the idibu board settings. As mentioned above, in the case of an unknown error, please contact our support team providing as much detail as possible, and we will investigate further.